This pop-up plaza on Stockton Street between Geary and Ellis provides a public open space during the construction of the Central Subway. 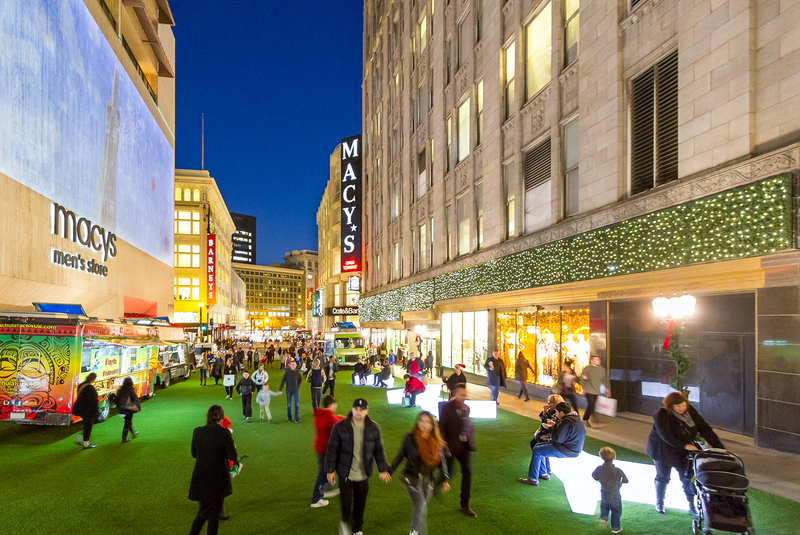 RHAA worked with the SFMTA and the Union Square Business Improvement District (BID) to create a space that offers a place for respite amongst the busy holiday bustle. The result of the design is a lively urban plaza rather than just asphalt. 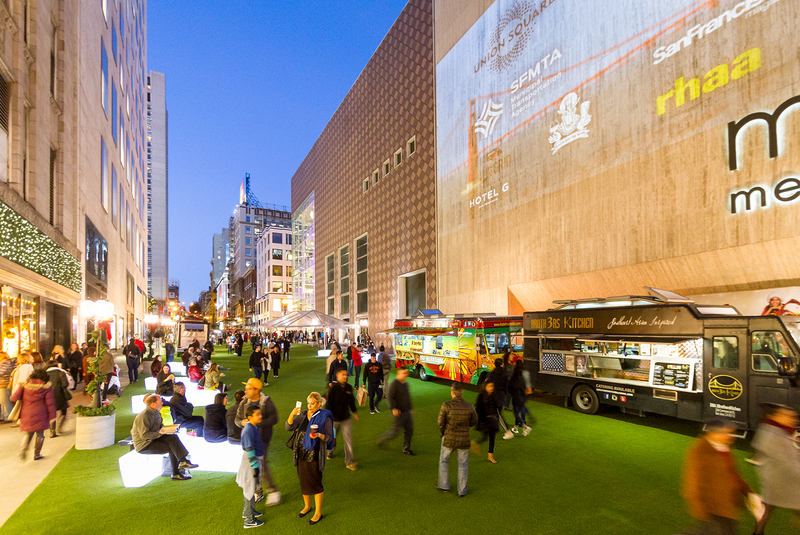 Working with the BID, RHAA helped select and implement a holiday light projection artist, as well as additional programming such as food trucks. The tremendous success of the plaza has allowed it to become the ‘go to’ place during the holiday. The success of the 2014 and 2015 Winter Walk has spurred the local businesses to increase the amount of events in the area this year. 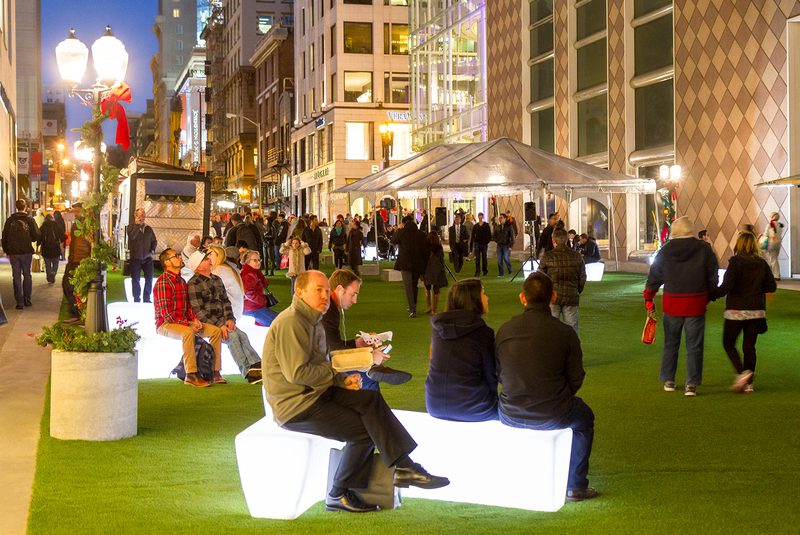 The 3-D holiday light show, Off the Grid food trucks, carolers, performers, SPCA puppy and kitten walks, makeup demos by Macy’s, fashion shows, and chocolate samples from Ghirardelli are only a few examples of the kind of things you may find when touring the two city blocks.